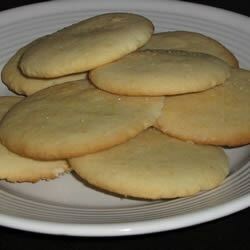 "Every time I make these cookies, they are gone within a day. You can make them crisp or chewy. I guarantee everyone will love them. For even better results, use a baking stone, they're great!" In a large bowl, cream together the shortening and white sugar. beat in the eggs one at a time then stir in the vanilla. Combine the flour, baking soda and cream of tartar; stir into the sugar mixture to form a dough. On a lightly floured surface, roll the dough out to 1/4 inch in thickness. Cut into desired shapes with cookie cutters. Place cookies 1 1/2 inches apart onto cookie sheets. My 6 year old daughter used this recipe, and her friends loved it. They turned out great! These cookies are delicious. my kids only liked them when they were hot. when they got cold my kids would not eat them.